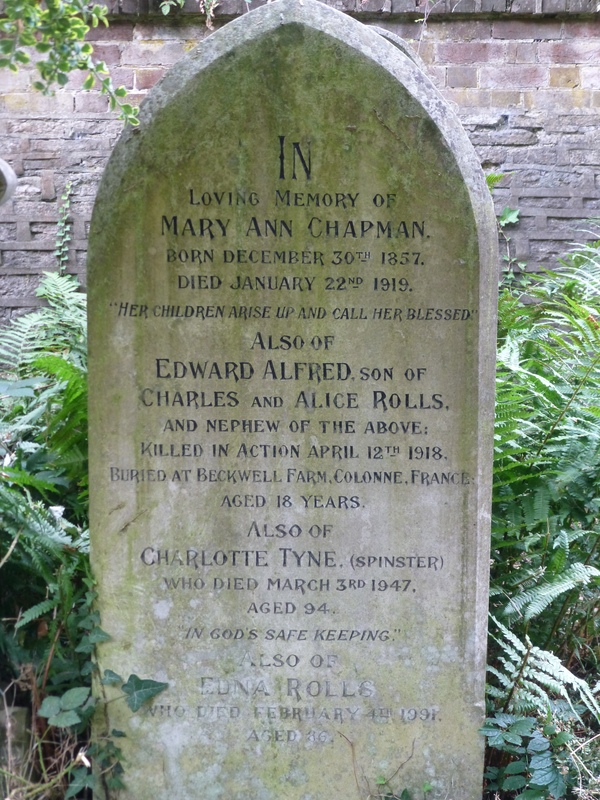 Edward’s parents were Charles (b.1871) and Alice Beatrice, nee Tyne (b.1871 – d.12.01.1941). Charles was born in Holdenhurst, Dorset and Alice was also born in Dorset. They married in Southampton in 1892. We are unsure of the date of Charles’ death. There is a death recorded for a Charles Rolls in Southampton in 1938 which would accurately link with Alice who died a widow. When she died Alice’s probate, dated 26.05.1941, left effects £1653 15s 9d to her daughter Winifred Ella (spinster). Alice died at Heather Lodge, Pinewood Road, Ferndown, Dorset. In the 1901 census Edward is living at 58 Fanshawe Street, Southampton with his parents and several of his siblings. His father is a General Shopkeeper. The family are still living at 13 Richmond Street in the 1911 census and there are another 2 children. George is now working as a Hotel Waiter. Married William Henry Reaney (b.1882 – d.24.07.1945) in Southampton in the last quarter of 1929. Probate for William – effects £236 left to Adelaide. He died at same address in Dorset, as her mother, Alice. Married Mildred M Kenniford (b.1897 – d.1994) in Hendon in 1923. Probate effects to sister Winifred Ella Flora. Married Marjorie Violet Cox (b.1904 – d.1974) in Southampton in the third quarter of 1929. Edna Doris A b.13.10.1904 – d.04.02.1991. We are not able to obtain Edward’s service history. There is a medal card for him and it records another service number of 70739 for the Devonshire Regiment but we are not able to verify this. The 2nd / 4th Battalion of the Oxford & Bucks Light Infantry was formed in Oxford in September 1914. They fought at the Battle of St Quentin, during the Battle of the Somme, Estaires, Hazebrouck, Bethune and Valenciennes. The 2/4th Battalion was formed at Oxford in September 1914 as a second line unit. In January 1915, the battalion moved to Northampton and was attached to 184th Brigade in 61st (2nd South Midland) Division. They then moved to Writtle and quickly on to Broomfield (Essex) in April 1915. In January 1916, they moved to Parkhouse Camp, Salisbury Plain and on the 24th May 1916 they landed in France. It was during the actions of the Somme that Edward was killed in April 1918. He is buried at the Saint Venant Robecq Road British Cemetery, Robecq, France Pas De Calais. Grave ref: I E. 8/9. Edward was awarded the Victory Medal and British War Medal. He is also remembered on a family grave at the Southampton Old Cemetery, grave ref: 42 G 63. Buried here are his two aunts Mary Ann Chapman and Charlotte Tyne, who are his mother’s sisters, and also his sister Edna. The grave inscription records that Edward was buried at Beckwell Farm, Colonne, France. RECORD OF THE 2/4th BATTALION.1st JULY 1917 to 31st DECEMBER 1918. Arrived 3 a.m. at Steenbecque. The Battalion ordered to march forward at once and take up a defensive position along the line of the Noe River, it having been reported that the Germans had broken through our battle positions and were threatening Merville. The 51st Division was reported to be holding a line east of Calonne. Operation orders issued, special instructions being left at the station for D Company.The Battalion halted from 7 to 8 a.m. for breakfasts, on the roadside west of Haverskerque; the C.O. and three Company Commanders rode forward through St. Venant to Les Amusoires, and discovered the situation to be serious. There were no troops holding about a mile of the Calonne-Robecq road, which had been reached by enemy patrols, while our artillery, which had withdrawn west of La Bassee Canal between9 and 10 a.m., put down a light barrage 500 yards north-west of the Calonne-Robecq road. In addition, a large ammunition dump along the St. Venant-Robecq road was on fire, and provided a valuable screen against observation by the numerous enemy observation balloons, but which on the other hand was likely to be a menace to the Battalion’s right flank, if manoeuvre was required. Under the circumstances orders were given for an attack to be pressed if necessary in order to gain the south-east bank of the Noe River. Companies moved forward in column of fours and 50 yards between platoons along the St. Venant-La Haye-Les Amusoires road, in C, B, A (C Company finding the advanced guard). The companies debouched from Les Amusoires and crossed the open ground to a point 200 yards north of the Calonne-Robecq road, when the advance was stopped on the left (C Company), owing to the inability of the 182nd Brigade on the left to make good the line of the road. The C.O. decided to disregard the danger of an exposed left flank, in favour of seizing the bridge-head at Q.14.c.8.2. ; and at 11.30 a.m. A and B Companies held the Robecq-Calonne road, with patrols across the Noe River; while C Company was fighting for the possession of the bridge-head at Q.14.c.72., and driving the enemy from Bacquerolles Farm. By 1 p.m. these latter objectives were in our hands, amongst the casualties being Captain Buttfield and 2nd Lieut. Bennett, wounded. During this fighting the finest use was made of Lewis guns and snipers from house roofs. The enemy resistance was not obstinate except at Bacquerolles Farm. Enemy artillery was active against the Calonne-Robecq road during the afternoon, and a heavy trench mortar of long range fired on Carvin and the houses in P.24.b., when A Company first occupied them. It was silenced by concentrated Lewis gun and rifle fire. During the night the position Carvin-Bacquerolles Farm was consolidated.